Florida doesn’t do anything by the book -- that includes celebrating the holidays. So this season, WUSF is extolling all the ways to enjoy the holidays with a Florida twist... and we want your input. Tell us about your Florida holiday tradition. Does your family take part in a lighted boat parade, lace up for a jingle bell run or spend New Year’s Eve making sand sculptures? Then there are the decorations. 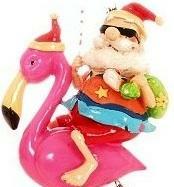 Show us your seashell ornaments, palm trees wrapped in lights and flamingoes in Santa hats. We want your recipes, too. Do you dress your gingerbread men in Bermuda shorts or dip your latkes in Key lime jelly? And how to do show out-of-town guests a good time in the warm weather? Do you take them caroling down the beach or spend all eight nights of Hanukkah at Disney? Your submission might end up on wusfnews.wusf.usf.edu/topic/florida-holidays ... or even on the radio. Leave a phone message for WUSF reporter/producer Dalia Colón at (813) 974-8636. We’ll collect your submissions through Dec. 21 at 5 p.m. Check this website daily for new content, and listen WUSF 89.7 through the end of the year to hear how your fellow Floridians celebrate the season.